Millicent Vernon Hammond was born in New York City, on February 25, 1910. Her father, Ogden Haggerty Hammond, was a wealthy financier and New Jersey state legislator; her mother, Mary Picton Stevens Hammond, died aboard the U.S.S. Lusitania in 1915 after a German U–boat torpedoed the ship.2 Millicent Hammond attended the elite Foxcroft School in Middleburg, Virginia, from 1923 until 1925. She then accompanied her father to Madrid when President Calvin Coolidge appointed him U.S. Ambassador to Spain. In 1929, she attended Columbia University and later studied with the philosopher Bertrand Russell at the New School for Social Research. In 1932, Hammond married businessman Hugh Fenwick, and they raised two children, Mary and Hugh. The Fenwicks separated six years later, however; they eventually divorced in 1945. Millicent Fenwick refused financial assistance from her family and, instead, found a job to support her children. She modeled briefly for Harper’s Bazaar and then took a job as associate editor on the staff of Condé Nast’s Vogue magazine. From 1938 to 1952, Fenwick worked on several Nast publications.3 In 1948, she wrote Vogue’s Book of Etiquette, a 600–page “treatise in proper behavior.” It sold more than a million copies. Fenwick left Vogue in 1952 and inherited a fortune when her father passed away a few years later. Fenwick’s earliest encounter with political issues came during the 1930s with the rise of fascism in Europe. “Hitler started me in politics; when I became aware of what he was doing to people, I fired up,” she recalled.4 She joined the National Conference of Christians and Jews in an attempt to counter anti–Semitic propaganda in the United States, speaking out in public for the first time in her life. Fenwick served on the Bernardsville, New Jersey, board of education from 1938 to 1947. She supported Wendell Willkie for President in 1940 and joined the National Association for the Advancement of Colored People in 1946. She worked on the 1954 campaign of Republican Senate candidate Clifford Case. She also chaired the Somerset County Legal Aid Society and the Bernardsville Recreation Commission. From 1958 to 1964, she was a member of the Bernardsville borough council and served on the New Jersey committee to the U.S. Commission on Civil Rights from 1958 to 1972. Her first campaign for state office was in 1970 when she won a seat in the New Jersey assembly at the age of 59. Fenwick served several years in the assembly before New Jersey Governor William Cahill appointed her the state’s first director of consumer affairs. She sought to restrict auto dealers’ misleading advertising and to require funeral homes to offer advance itemization of bills. After Fenwick left office in January 1983, President Reagan appointed her to the United Nations Agencies for Food and Agriculture, where she served as United States Representative with rank of ambassador from 1983 to 1985. Millicent Fenwick retired to Bernardsville, where she lived until her death on September 16, 1992. 1Current Biography, 1977 (New York: H.W. Wilson and Company, 1977): 153–156; see also Amy Shapiro”s biography, Millicent Fenwick: Her Way (New Brunswick, NJ: Rutgers University Press, 2003). For a typical press feature story from the period, see Louise Sweeney, “Congress’s Millicent Fenwick: A Blueblood with a Social Conscience,” 25 June 1975, Christian Science Monitor: 17. 2Bruce Lambert, “Millicent Fenwick, 82, Dies; Gave Character to Congress,” 17 September 1992, New York Times: D25. 3Judy Bachrach, “ Millicent Fenwick,” 23 February 1975, Washington Post: 137. 4S.J. Horner, “ Millicent Fenwick Remembers,” 9 December 1979, New York Times: NJ45. 5Ronald Sullivan, “Mrs. Fenwick Edges Out Kean in Jersey Primary,” 5 June 1974, New York Times: 89. 6Schapiro, Millicent Fenwick: 141, 143. 8“Election Statistics, 1920 to Present,” http://clerk.house.gov/member_info/electionInfo/index.aspx. Edward C. Burks, “Millicent Fenwick: Personal Diplomacy,” 9 July 1978, New York Times: NJ1. 13Edward C. Burks, “Rep. Fenwick: Basics Her Forte,” 13 May 1979, New York Times: NJ4; see also, Edward C. Burks, “Mrs. Fenwick Sees Marriage Tax’s End,” 1 March 1981, New York Times: NJ1. 14Amy Schapiro, Millicent Fenwick: 193. 15Spencer Rich, “GOP Panel Adopts A Pro–ERA Plank,” 13 August 1976, Washington Post: A1. 16Leslie Bennetts, “Republicans and Women’s Issues: For Some, A Painful Conflict,” 2 September 1980, New York Times: B12. 17Deborah Churchman, “Congresswomen’s Caucus Wields Clout Beyond Its Size,” 11 June 1981, Christian Science Monitor: 17. 18Edward C. Burks, “‘Fenwick Doctrine’ Altering Foreign Aid,” 13 April 1980, New York Times: NJ4. 19Millicent Fenwick, “Congressional Reform: A View From the Inside,” 24 August 1976, Washington Post: A17. 20Millicent Fenwick, “Congress Must Give Up It’s Royalty Complex,” 5 October 1978, Christian Science Monitor: 23. 22Shirley Washington, Outstanding Women Members of Congress (Washington, D.C.: U.S. Capitol Historical Society, 1995): 30. 23Abscam was a U.S. scandal that followed a 1978 investigation by the Federal Bureau of Investigation (FBI). FBI agents, posing as associates of a fictitious wealthy Arab sheik, tried to pay U.S. officials in exchange for political favors. The media derived the name Abscam from the name of the fake company set up by the FBI to conduct its investigation, “Abdul Enterprises, Inc.” Five Representatives and Senator Williams were indicted and convicted in 1981 for bribery and conspiracy. 24Margot Hornblower, “Fighting Fenwick ‘Legend,’ Lautenberg Takes to the Airwaves,” 27 October 1982, Washington Post: A14. 25Michael Norman, “Lautenberg Pictures Mrs. Fenwick as ‘Eccentric’ Who Can’t Do Job,” 21 October 1982, New York Times: B9. 26Ward Morehouse III, “Millicent and the Millionaire: Big Bucks, Tough Talk Mean Lively Race,” 20 September 1982, Christian Science Monitor: 5. 27Joseph Sullivan, “Jersey Democrat, in First Contest, Upsets Rep. Fenwick for the Senate,” 3 November 1982, New York Times: A1; “Election Statistics, 1920 to Present,” http://clerk.house.gov/member_info/electionInfo/index.aspx. 28“ Millicent Fenwick’s Defeat,” 4 November 1982, Washington Post: A18; see Fenwick’s own editorial “In Congress: Buy Your Seat Or Sell Your Vote,” 9 November 1982, Washington Post: A1. Papers: 1975-1982, approximately 310 cubic feet. 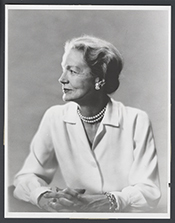 The papers of Millicent Fenwick include correspondence, administrative files, legislative research files, sponsored and cosponsored bills, project files, political and campaign files, financial documents, photographs, press releases, constituent newsletters, and other papers. A container list is available in the repository. Parts of the collection are restricted. Papers: 1975-1980, approximately 4.5 cubic feet. The Millicent Fenwick papers mainly contain invitations. A finding aid is available in the repository and online. Fenwick, Millicent. Speaking Up. Foreword by Norman Cousins. New York: Harper and Row, Publishers, 1982. ___. Vogue's Book of Etiquette: A Complete Guide to Traditional Forms and Modern Usage. New York: Simon and Schuster, 1948. "Millicent Hammond Fenwick" in Women in Congress, 1917-2006. Prepared under the direction of the Committee on House Administration by the Office of History & Preservation, U.S. House of Representatives. Washington: Government Printing Office, 2006. Schapiro, Amy. Millicent Fenwick: Her Way. New Brunswick, N.J.: Rutgers University Press, 2003. U.S. Congress. Senate. Committee on Foreign Relations. Nomination of Hon. Millicent Fenwick: Hearing before the Committee on Foreign Relations, United States Senate, Ninety-eighth Congress, first session, on the nomination of Hon. Millicent Fenwick, of New Jersey, for the rank of Ambassador, July 20, 1983. 98th Cong., 1st sess., 1983. Washington: Government Printing Office, 1983.